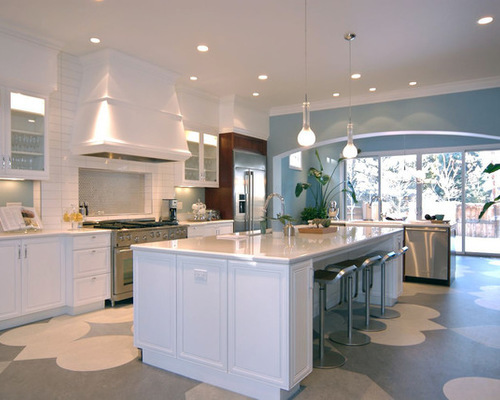 This article was originally published on Houzz on June 4, 2012, as "Ecofriendly Kitchen: How to Choose Flooring," and is presented here with permission. Read the original article. 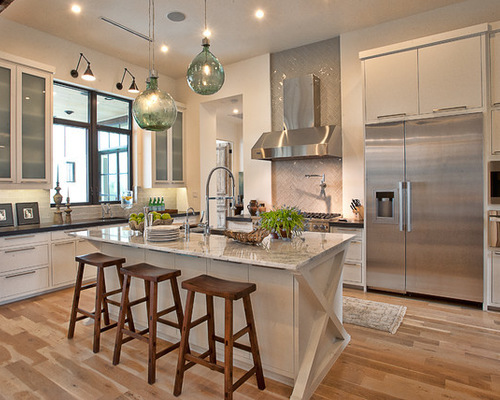 Going green with your kitchen floor brings benefits beyond making you feel good about your selection. Durability is the biggest prize. Think of homes with wood floors that may be nearing a century old—this is sustainable thinking at its best, because a long life expectancy born of durable materials means conservation of natural resources. And this approach is kind to your financial resources, too. Photo credit Cornerstone Architects; original photo on Houzz. Ecologically speaking, wood can be the best or the worst of materials. It can be almost perfect when harvested sustainably. It's durable, it has a long life cycle, and milling can be simple and require little energy. However, wood that's not harvested sustainably can be environmentally destructive. When choosing wood floors, look for the following to ensure you're making the most sustainable choice. FSC-certified: The Forest Stewardship Council (FSC) is an independent agency that provides certification, or approval, to wood that's been harvested in a responsible manner. Think of it as wood's equivalent of organic. Local species: Wood that's been harvested locally minimizes transportation-related energy, supports the local economy and reinforces the sense of place. Hardness: The Janka scale measures the resistance of a species of wood to denting and wear. The scale ranges from 22 up to 5,000. Teak comes in at 1,000. Photo credit Viridian Floor; original photo on Houzz. Reclaimed wood floors. Smart manufacturers are seeking sustainable opportunities. Viridian Wood salvages shipping crates made of tropical hardwoods and repurposes them into high-performance, FSC-certified floors. This house showcases Viridian's dark blend of Jakarta wood throughout the kitchen and the rest of the home. Tropical hardwoods are the hardest woods on the planet, occupying the top positions on the Janka scale, which makes them a great choice for durable flooring. However, the harvesting of tropical woods causes significant ecological destruction. Seeking FSC-certified wood is especially important with tropical hardwoods, as it will ensure the wood was harvested in a sustainable manner. Photo credit: Alan Mascord Design Associates Inc; original photo on Houzz. Engineered wood floors. 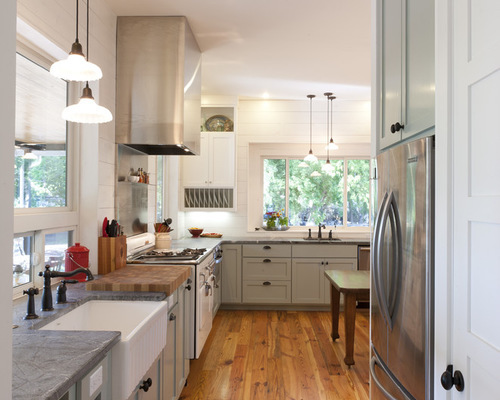 Extending wood floors into the kitchen is a terrific way to seam together several spaces, as this home demonstrates. 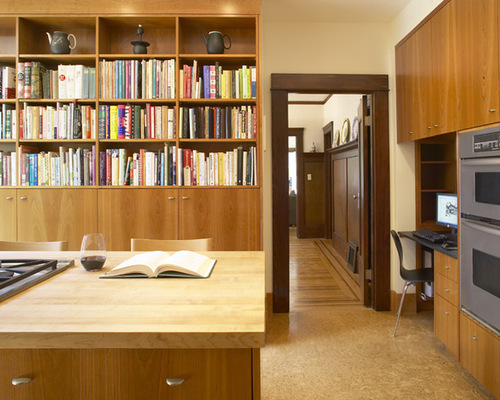 Doing so requires a stout floor that can take the wear a kitchen doles out. Engineered wood floors can be a durable choice, since they have a thin veneer of finished wood backed by several layers, or plys, of more wood. This layered system makes engineered wood more stable than solid wood and less likely to warp when faced with temperature changes and humidity. Look for FSC-certified and formaldehyde-free options. Photo credit: Rauser Design; original photo on Houzz. Salvaged wood floors. Why use material with recycled content when you can upcycle materials? Doing so sets the bar high for sustainability and is an opportunity to bring some history and personality to your kitchen. Salvaged beams from a 100-year-old warehouse roof were milled into tongue and groove flooring for this kitchen. 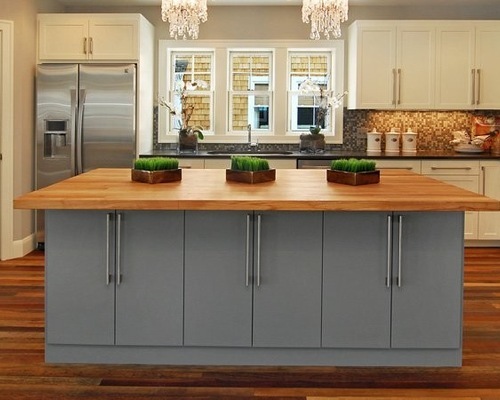 Photo credit: Three Week Kitchens; original photo on Houzz. Linoleum floors. Poor linoleum. Over time, it's been confused with ubiquitous and often not-so-nice sheet vinyl, when in fact the two have little in common. True linoleum is made of natural materials, including linseed oil, and is inherently antimicrobial—a pretty neat trait for a kitchen. Linoleum is available in sheets, tiles or planks. If you're not creating a pattern with tiles, I recommend using sheets, as you'll have fewer joints and fewer places for the floor to show its age. Make sure that any adhesives are free of solvents and labeled "no-VOC." Forbo's Marmoleum, one of the best-known linoleum sources, carries a 25-year warranty and offers more than 120 colors of sheet goods. 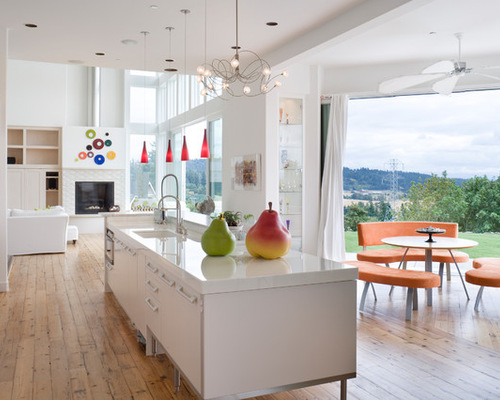 This kitchen shows how linoleum can be an artist's canvas for color and pattern. Photo credit: Burton Architecture; original photo on Houzz. Cork floors. The warmth and comfort of cork underfoot makes it a great choice for the kitchen, where we often stand for long periods of time. Cork also touts a lot of green cred: It's a rapidly renewable and carefully protected resource. Every nine years, producers in Portugal and Spain strip the thin bark of cork trees into long, wide slabs, using care not to damage the tree. Wine corks are stamped out first, and the scraps are then ground and pressed to make flooring and bulletin boards, so that every bit that is harvested is used. Cork is available in both tiles and planks. With both, I seek prefinished products with a no-VOC finish. With any prefinished tile or plank product, the vertical edges often aren't prefinished, so it's worth adding a top coat of finish after installation to protect the edges and joints. Cork manufacturers have broadened their palettes to include pale, dark and colored options, as well as a variety of patterns. Rubber-cork-blend floors. Cushy cork gets a new look when blended with recycled rubber, as in CapriCork's And/Or line, made with 35 percent preconsumer recycled content. The product is available in both rolls and tiles, and comes in 17 different colors, from neutral to bright shades. Concrete floors. The ultimate multitasker, concrete floors are often both the finished floor and the structural floor too. Simplifying a complex flooring system to a single material is a smart, efficient and cost-effective solution. To green your concrete, you can increase the fly-ash content (a byproduct of coal processing), but do so only if coal is processed in your region. Otherwise, the environmental impacts of transporting the fly ash outweigh the benefits. Alternatively, consider adding recycled glass to reduce the amount of virgin aggregate used. Terrazzo floors. Seemingly indestructible, terrazzo gets an A+ for durability, and also for its good looks. This material, made of chips of marble or granite set in concrete and polished, can score high for sustainability too if no- or low-VOC sealers and low-impact aggregates (like recycled glass) are used. Terrazzo's one shortcoming is that it can be tough to stand on for long periods of time. What is the best option for sound barrier flooring for multi-family housing?